The skyline in Singapore’s central business district. CapitaLand and City Developments said on Thursday that their joint venture won a mixed-use residential and commercial site in Singapore’s Sengkang Central at a tender price of S$777.78 million under the “two-envelope” and price revenue tender bidding system. In a two-envelope system, the technical proposal of the bid is separated from the price proposal, with the latter only opened after the former is determined to meet the bidding criteria. “The joint venture will transform the 3.7-hectare site – the largest commercial and residential site awarded since 2015 – into an integrated community hub with 700 residential apartments, meeting the needs of residents in Buangkok with amenities such as a hawker centre, community club, childcare center, retail shops, as well as public rail and bus transport facilities sited in a one-stop location,” the statement said. The bid works out to S$923.60 per square foot of the gross floor area of 78,236 square meters, the two companies said in a filing to SGX after the market close on Thursday. 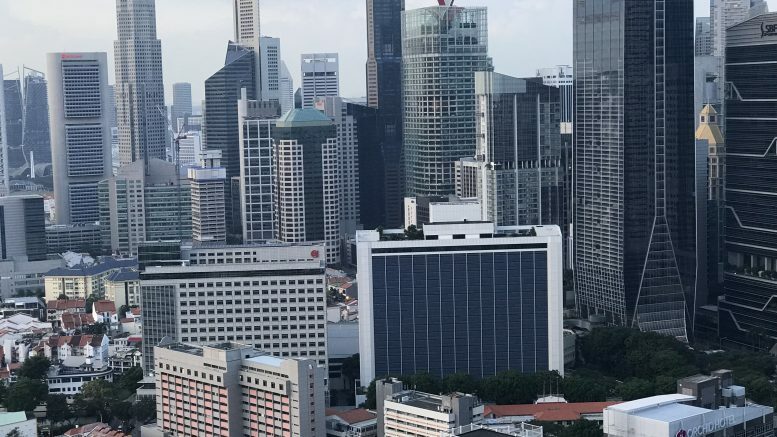 Singapore property developer City Developments said on Thursday that it bought back 300,000 shares in the market at S$9.44 to S$9.54 each, for a total consideration including other costs of S$2.85 million. That marked 0.033 percent of issued shares excluding treasury shares, it said in a filing to SGX after the market close on Thursday. This was the first share buyback by City Developments, after passing a mandate at its annual general meeting in April, it said in the filing. In a separate press release, CityDev, or CDL, said the average purchase price of S$9.485 was a discount of nearly 15 percent to its net asset value per share of S$11.13 as of 30 June 2018. “There is deep value in our shares and we have confidence in CDL’s strong fundamentals and future growth potential,” Sherman Kwek, CEO of CDL, said in the press release. “Our robust balance sheet enables us to initiate our share buyback exercise to enhance returns for shareholders. We will continue to seek investments for CDL, capitalising on both internal and external opportunities,” he said. CityDev’s shares have languished since the government announced new property cooling measures in July. It said the purchased shares would be held as treasury shares, with some potentially used for its long-term incentive plans. OCBC Bank said on Friday that it has priced S$1 billion 4.00 percent perpetual capital securities first callable in 2023 under its US$30 billion global medium term note program. Singapore (MAS),” it said in a filing to SGX before the market open on Friday. The capital securities may be redeemed at the bank’s option on 24 August 2023 or at any distribution data after that time, on the occurrance of a tax event, or if the securities no longer qualify as eligible capital, it said. City Developments said on Thursday that Hong Leong Intenational Hotel (Singapore), or HLIHS, acquired an additional 0.02 percent equity interest in Taiwan-based Hong Leong Hotel Development, which owns the Grand Hyatt Taipei, for S$18,176 from an unrelated third party shareholder on 6 August. HLIHS is an indirect subsidiary of Millennium & Copthorne Hotels, which is a subsidiary of City Developments, it said in a filing to SGX after the market close on Thursday. The acquisition will increase HLIHS’ shareholding in Hong Leong Hotel Development to 86.22 percent, it said. The deal isn’t expected to have a material impact on the net tangible assets or earnings per share of the group for the current financial year, it said. CapitaLand said on Thursday it bought back 1,049,600 shares in the market at S$3.27 to S$3.31 each for a total consideration including other costs of S$3,44 million. Since the beginning of the buyback mandate in April 2018, CapitaLand has bought back 0.72 percent of its issued shares excluding treasury shares, it said in a filing to SGX after the market close on Thursday. China property developer Yanlord Land said on Thursday that it set up a wholly owned subsidiary, Nanjing Renyuan Investment, in Nantong, China, with a registered capital of 500,000 yuan. The new subsidiary will be involved in construction engineering and other related activities, it said in a filing to SGX after the market close on Thursday. It said the transaction wasn’t expected to have a material impact on net tangible assets per share or earnings per share for the financial year ending 31 December. EMAS Offshore, or EOL, said on Thursday that it would seek legal advice after the Financial Supervisory Authority of Norway resolved on 15 August to require the Oslo Stock Exchange to delist its shares as of 28 September. The company, which is a unit of Ezra, has three weeks to appeal the decision, it said in a filing to SGX after the market close on Thursday. Earlier this year, EMAS had successfully appealed an OSE move to delist its shares due to its inability to disclose financial information by the exchange’s deadlines, according to a Business Times report. Earlier this month, the company and its subsidiaries said in an SGX filing that despite talks with potential investors and key lenders, it had not reached a restructuring proposal that was acceptable to the parties. That meant the moratoria over creditors taking action against EMAS and two subsidiaries expired on 6 August, it said. EMAS’ Singapore-listed shares were placed under mandatory suspension in March 2017.